Baby Whisperer Tips to Get Baby Sleeping Through the Night. 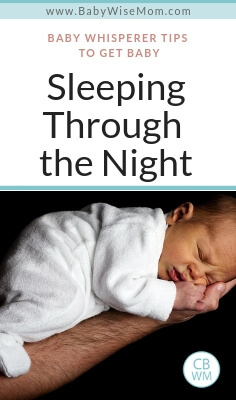 What to do to help baby sleep through the night. Don’t let baby sleep too much in the day. This means you don’t let baby sleep something like 6 hours straight in the day. You can let baby take an extra 30 minutes in a nap if needed, but you don’t let baby sleep all day. Cluster feeding. Hogg suggests starting at 6 weeks you feed every two hours before bedtime and also do a dreamfeed. The cluster feeding thing is necessary for some babies, but not all. I would think if baby got a full feeding, he shouldn’t need another one 2 hours later. But I know as a nurser, my milk supply is lower at that time of day, so both of mine needed one two hour interval for a while. Hogg defines a dreamfeed as a feed you try to not wake baby for (the late-evening feeding for the BW baby). Kaitlyn would rarely wake up for a dreamfeed, but I was not cautions to not wake her. If she woke, she woke. Pacifier. Hogg says so long as you don’t turn it into a prop, you can use the pacifier to wean baby off the nighttime feed. You basically use the pacifier in place of breast or bottle when they wake, cutting down sucking time each night. See Secrets of the Baby Whisperer for more. Don’t rush in. Babies sleep fitfully. Do not respond to every noise you hear. It took me a long time to learn this with Brayden, and I was really good about it with Kaitlyn. Give baby a chance to work things out on her own. Hogg’s pacifier suggestion really worked for us. At the time 5-8 weeks, our daughter was sleeping in the bassinet right next to our bed at night. When she would wake up in the night, I would reach over and give the pacifier. If she soothed herself back to sleep, then I knew she was not waking out of hunger. If she couldn’t, I would get up and feed her. With this method, she very quickly extended her nighttime sleep and was sleeping through the night by 7.5 weeks and we moved her into her room a few weeks later. Thanks Grovers–that is good to hear a success story of the method. Hi! We had a very similar success story as the Grovers with the pacifier. 🙂 Now we’re working on weaning her off the getting up in the middle of the night for the paci! Not so much fun… anyone have any tips? CIO did NOT work. BUT this method allowed us to go from 11p.m. – 6 a.m. from Week 5! She was never really hungry in the middle of the night and because we used the pacifier, the breast was never a sleep aid… i.e. my sweet hubby can help with the middle of the night wake-ups. Now my three month old sleeps consistently from 8 p.m – 6 a.m. with one 5 second wake up at 4 a.m. for pacifier insertion. Not ideal, but works for us! Thanks for posting this – such an important topic for new moms! Megan, the only thing I could think of for you would be to give her some time when she wakes to see if she would go back to sleep on her own. I understand the trickiness of the situation. If you don’t catch her quickly, she will be fully awake. However, at this point it might be time to do CIO and drop the paci in the night. Advice Please…First off, what is considered sleeping through the night? How many hours and from what hour to what hour? Here is my situation-My son is almost 4 months and we do the eat, wake, sleep, but he rarely sleeps more than 45m-1.5 hrs. which makes it hard to do a straight 3 hr schedule. He wakes in the 5 a.m. hour and I feed him and put him back to sleep. Then he wakes or I wake him at 7:30. He then feeds 10:30, 12:30, 3:30, 6:30 and before bed at about 7:30/8 p.m.(It keeps getting earlier.) I would like to cut out one of his feedings, but I don’t know how. I would like him to go past 5 a.m., but he seems pretty insistent on it. If I got him on a true 3 hr. plan, then we would have our last feeding at 7:30 p.m. naturally. But at this point his p.m. feedings are pretty much set in stone. What would you suggest? I would intro a dream feed if I knew it would take him til 6:30/7 a.m.(though so far the times I have tried it, it has made no difference), but I don’t want to start another bad habit since he is already waking at 5 a.m. and I want to break him of that. But asking him to go 6:30-6:30 is a bit much and I doubt he would sleep 11 of those 12 hours. Suggestions? My daughter (now 8 weeks) slept through the night a few times starting around 6 weeks. I finally figured out that she was going through a growth spurt during that time, and the extra feeding during the day allowed her to sleep all night, so I decided to add a feeding to her day, which means we are on a 2.5 hour schedule instead of 3. But it worked! She sleeps straight to 7:30 in the morning after her dream feed at 10:30. But now my question is when do I put her back on the 3 hour schedule? She has always eaten every 3 hours since birth, but only now has been sleeping through the night with the 2.5 hour schedule. Should I change it slowly? I don’t want to push it because I love that she is sleeping all night, yet I think for her age she should be able to go 3 hours. Janna, you might have to keep it for a while. Babies her age usually can only do 7-8 hours straight, and she is doing about 9. For that reason, she might need a 2.5 hour schedule where other babies her age would be fine on 3. I would leave her there until she reached the age for 9 hours of sleep at night (see this post: Babywise Milestones) or you are sure she needs to go 3 hours rather than 2. Please help!! My baby is now 7 months old and I have been following a Babywise routine since she was a few days old. She was sleeping through the night at 5 weeks (with her last feed sometime around 11pm) but has just started waking in the night again now. I breastfeed her 4 times a day.. at 6am when she wakes naturally, 10am, 2pm and 6pm, with solids offered after each feed. She goes to bed between 7pm to 8pm and up until about a week ago, was sleeping through the night no problem until 6am. She is now waking almost every night, usually only once, but last night, she woke twice. It does not seem to be the same time each night that she wakes. When she wakes, I feed her one side, and she happily goes straight back to sleep again, no problem. I have tried just picking her up to soothe her in the night as I am afraid that if I get in the habit of giving a breastfeed at night, then it will become a habit, but this doesn’t work! She just cries louder when I try putting her back down again. I am anxious to get my baby back in to her routine, as we are going on holiday in 2 weeks, and I am leaving her with my mum for 12 days!! Will feel much happier going if she is sleeping through the night again… please help!!! She is teething at the moment, but I don’t know if this is causing her to wake, because she goes back to sleep happily after a feed, without requiring any pain medication. Do I need to change my daytime routine.. perhaps go back to 5 feeds? Lately, she tends to wake about half an hour to an hour prior to her next scheduled feed during the day. She is quite happy to wait for her feed, but this means that we are not following the sleep, feed, wake cycle during the day anymore. I have tried extending her waketime but she gets too tired. I have read the Babywise book a couple of times, but can’t find an answer to my problem!! Would be grateful for any advice please!! I am really at a loss. We have been putting our almost 6 month old down every night with the same routine…and we dropped a feeding cause we think that he is large enough to last through the night (18lbs). It has been almost 2 months now and he still wakes up 2 a night screaming. Once at 1 am and once about 4 am. We just let him CIO, cause that is what we were told to do, but he still hasn’t learned. What are we doing wrong?? Hi! I’ve been reading the blog for a while and love it. Thanks! I have a question for you. Daytimes are going ok for us; we have a good 3-hour schedule in place for our 10-week-old (though it gets messed up occasionally for church or when we have a sitter). Nights, however, are difficult. He’s still waking every 3 hours, sometimes every 2 hours, or even less. It’s not consistent, but it is frustrating. The closer to morning it is, the closer the waking intervals. Is it reasonable at this age to expect him to drop a feeding? Also, if we try to use a pacifier when he wakes at night, at what point do we give up and assume it’s hunger? It seems like once he wakes up, he gets really worked up no matter what we do and won’t go back to sleep. Thanks so much!! Amber, I would say most 10 week olds who aren’t STTN have only one feeding. After a couple of nights of pacifier not working (maybe 3), I would assume it is hunger. But if it is hunger, he will most likely wake up soon after falling back asleep. Hi, it’s me again. Our little guy is almost 4 months old now, and still waking several times at night. Waketime is 7am, and his last feeding before bed is 7pm….bedtime 7:30-ish. Sometimes he’ll sleep for 4 hours after bedtime, sometimes less; but then for the rest of the night he wakes up every 3 hours or even less. When I tried using the pacifier, he would either not calm back down or wake up in 20 minutes, and then eat as if he’s really hungry. I’m pretty sure he could drop that last night feeding because he’s not too hungry at 7am, but I don’t know how. Trying to feed for less time at night resulted in him waking up again after an hour or so. Any other ideas? Anything that we could be doing differently? Or is he just not ready to sleep through the night? i really don’t want bad habits to develop. Thanks!! Amber, it sounds like he isn’t ready. Since he is waking shortly after a small meal, it sounds like he needs it. 4 months is also a huge growth time, so keep that in mind. Hi! I’ve been reading comments and your responses, and have found lots of helpful information. Shortly after my last post, our 4-month-old started sleeping all the way from the 11pm dreamfeed to 7 a.m. We had a glorious few weeks of that, but then the holidays, an ear infection, a cold, and learning to roll over made him start waking up frequently. It’s been a couple of weeks now, and whenever he rolls over he gets stuck and wakes up. We are working so hard during the day to get him to roll back (from tummy to back). He usually wakes every 20-45 minutes starting at 4 a.m. (we roll him back over each time)…by 6am he’s fully awake and probably too hungry to go back to sleep! Do we just have to wait this out? Any suggestions from anyone? Thanks! Have a great day! Hello,I have a question on what we should do with our 9 week old son. I was so hoping he’d be sleeping through the night (7-8 hours) by now, but he’s still not. He usually wakes up around 4ish for a feeding. I’ve tried giving him the paci sometimes but it usually doesn’t work. I noticed that sometimes he’s only getting 7 feedings a day, instead of 8, like you say they should have until they are STTN. By the way, he’s being formula fed (breastfeeding didn’t work out like I hoped it would!). How important do you think it is for him to get 8 feedings a day? Do you think that might be why he’s still waking up for one feeding in the middle of the night? I just hate waking him up from naps during the day. Ha! Also, do you think it’s ok to go in and give him his paci at that 45 min mark of a nap? Our son seems to wake up A LOT when that 45 min mark hits and sometimes he can go back to sleep but sometimes not. Like when he wakes up, there’s no turning back for him. That’s why I try to give him teh paci so he’ll keep sleeping. Is that ok? Thanks for your advice. And I think you’re doing a great job with the blog, by the way! Amy, the more calories he gets in the day, the less he will need at night. I would try for 8 a day until he STTN. You can try the paci at 45 minutes. I would be careful and be watchful. You don’t want it to become something he needs long-term, but it could be something short-term that would help him. Hi! Again, thank you so much for your time and effort! You are playing a VITAL role helping me work out the kinks of teaching good sleep habits to my Little Man. My Little Man is 10 weeks old. He is wonderful Little Guy with a great disposition. He is exclusively being bottle fed. He is taking 5-6 ounces every three hours during the day. His bedtime is 7/7:30. He goes down very well for bedtimes and naps and we have been CIO since I spoke with you ast (about 5 weeks). He does great and is rarely having episodes when he cries extensively. (He does have episodes at the one hour mark after he is put down at night or nap time where he will cry for a short period but then settles himself back down.) My questions lie in getting him to sleep through the night. Collin goes down at 7/7:30. We then get him out of bed for a “dreamfeed” at 10/10:30. He does not wake up for this and only will take 2 or 3ounces when he normally takes 5 or 6 when he is awake. I have tried to wake him up and he will not wake up for this feed. He was consistently waking at 2:30 for a couple weeks and is now waking at 3 or 3:30. He then wakes at 5:30 or 6. I want his “waketime” to be 6:30 am. I am lost as to what to do to get him to STTN.1) Should I continue to get him up for a dreamfeed even though he only takes 2 or 3 ounces or should I just let him sleep from 7/7:30 and see how long he goes? My fear there is that if he goes 8 hours from 7:30 that would still have me getting up at 3:30 which (obviously) is not ideal! 8 hours from 10 or 10:30 is much better for Mommy! LOL 2) Should I continue to feed him at the 2:30/3:00 feed as well as the 5:30/6 feed? If not which should I drop and how should I drop it? Should I drop it cold turkey or make him strech it more since this is what he seems to be doing naturally?I am just not sure where to go form here! I look forward to hearing from you! Hi Val, I posted a question a few days ago on this thread. I also have a couple of updates to my question that may lead to different suggestions from you.Since the last post I have been able to get Collin (my very tired, not awake DFeeder) to take a full 6 ounce feed most night at 9:30 or 10 o’clock. It takes me a long while (like a solid hour) to get him to take it but he has most nights. He then has been sleeping till 4 or 5 am. This causes an issue with not taking a full feeding at his 6:30 wake time.The nights when he hasn’t taken a full feed (only 2 or 3 ounces) he wakes at 1:30-2:30. This stinks because it is a VERY middle of the night feed.My new questions are:1) Do I continue to wake him for the DF and just cross my fingers that he takes more than 2-3 ounces (even though it is taking him an hour to get a full feed down when he takes it) since it results in a longer night sleep? Then I will just have to work on the Early Waking.2) Do I try skipping the DF and see what happens? Since he wakes at 2 or so when he only takes 2-3 ounces at the DF I am guessing skipping the DF will result in a middle of the night feed at 2:30 or so. This would save me from getting him out of bed for just a possible 2-3 ounces feeding. I could be wrong and he may surprise me and sleep longer– should I try it? 3) Each of the above situations results in its own issues which then need to be fixed so I would love to know what option to go with… Thanks again Val!!! Lucie, I am sorry I am so late. I didn’t see your question until now. I would probably try skipping the DF and see what happens, but know that at his age at best you can expect 11 hours of sleep (since he is bottlefed), but 9-10 would also be acceptable for him. If he went to 9, that will put him waking at 4. This isn’t a problem as far as he goes, but might be for you.My guess is the same as yours that since when he eats well at the DF he sleeps longer that he actually needs that food to get him through. Some do sleep longer though, and I have a friend who says it doesn’t hurt to try it. Really any of your “fixes” are acceptable. You are just going to have to decide which one you prefer. He isn’t old enough to make it 12 hours yet. It is possible for 11, but it doesn’t sound like he is quite ready. Pick which solution is best for you. Hi there. My son began sttn last week at 10 1/2 weeks old…it’s been a week now. He slept straight through from his df at 1030 till 830 the next morning for the first few nights. The last few nights he has woken up at 5 am. The first night was because he pooped so I changed him and reswaddled him and he went back to sleep. The next night he woke because he broke out of his swaddle,I changed him reswaddled and he cried a bit but went back to bed. Last night he woke up still swaddled and no poop. He began with a soft cry and persistently got louder until I got him about 20 minutes later. I made him a 3 oz bottle, he normally heats about 4.5 oz. He ate it like a champ and then went back to bed. This morning he would not take a full feeding at his breakfast time of 830 am. I am wondering at what point do I just let him cry this out if he continues to do this even though he might be hungry because we know he can make it till 830 am? I pondered the idea this may be a growth spurt since he is 11 1/2 weeks old but when he wouldn’t finish his breakfast this morning I’m thinking maybe not. Anyways, any thoughts or ideas you have for us to get him back to sttn would be greatly appreciated. Thanks so much! Since he eats from a bottle, you can add an ounce or two to each bottle in the day to be sure he is getting enough food. If it is a growth spurt, this can help that.If he is hungry, you always want to feed him, but since he isn’t eating well at breakfast, that tells you he doesn’t need a full feeding at the time. I would start with adding more to the day, then you can confidently know he has had the calories he needs in the night.He also might be getting ready to drop the swaddle. Analyze that, also.See also: Early Morning Feedings Before Waketime: http://babywisemom.blogspot.com/2008/01/early-morning-feedings-before-waketime.htmlfor ideas. Good luck! Ok, sorry, one last question for a while 🙂 …I was reading your notes on cluster feeding and wondering if that’s what I need to be doing. My son is almost 9 weeks old and I feel like he might not be getting enough to eat in the evenings. There are many times that he wakes early from his naps (only in the evening) but I have been reluctant to feed him too early every night for fear of getting him stuck on a weird schedule. (I just spent the last week working him through a growth spurt, so I don’t feel that this could be another growth spurt but just a milk supply problem.) Plus, I feel like he should be on his way to sttn, but he is still waking up at least once in the middle of the night. Do you think I should try feeding every 2 hours in the evenings to make up for a possible low milk supply and to help encourage him to sttn? If so, should I start the 2 hours at the 4:30 feeding or his 7:30 feeding? Also, how long do you have to do that before going back to the constant 3-hour schedule?Thanks again! Just to update…Drew is now STTN, but he is still sometimes waking early after his evening naps to eat–sometimes an hour before his next feeding, so…I’m still wondering what could be causing this and what I should do to fix it. Hi Drews Mama,When My son was 9weeks old we were on a 2.5/3 hour schedule. He would sleep for 8 hours strait at night then I would feed him around 5am in the morning and then he would go back to sleep until 7am. The Last nap of the night was short. Usually the last nap of the night ends up being about 30-45 min cat naps. Eventually, my son would stop sleeping well for that nap or at night and I would just drop that cat nap in the evening and just entertain him until he had to go to sleep. Also, the last two feedings of the day were only 2 hours apart and that is okay. It will not mess up your schedule for the rest of the day if you are keeping the feedings 3 hour apart. To answer your question as to how long you should cluster feed at night, do it as long as your baby needs. I found that my son needed cluster feeding at night until he was 4.5 months old (every baby is different).Here is what our schedule looked like:7:00 Feed (Nap) 8:30-9:309:30 Feed (Nap) 11:00-12:3012:30 Feed (Nap) 2:00-4:304:30 Feed (Nap) 6:00-7:307:30 Feed (Nap) 9:00-9:30 9:30 Feed & Put to Bed(would wake around 5am for a feeding)If you have any questions, please feel free to email me at [email protected]. I know that Val is busy with her newborn so I would be happy to answer any questions you might have the best I can! Thank you so much for this blog. It has been so helpful for me!! I have a couple questions, though. My son will be 6 weeks old tomorrow and is on a 3 hour schedule. I’m wondering how many times a day he should be eating (he is exclusively formula feed-my breastmilk never came in enough) and when he should/could be sleeping through the night. He takes about 1 1/2 hr naps after each cycle. I have been doing BW since he was about 2 weeks old. (Our waketimes have only recently begun to extend themselves.) Thank you for your help!! DrewsMama, It can’t hurt to try it out and see what happens. When my kids needed two hour intervals, it would be after the 4:00ish feeding. So it would be 4, 6, then you could do 8 and/or wait for a dreamfeed between 10-11 PM. Thanks for your help Susanne! Hi there. Thank you for your blog, I’ve been following for a few weeks now. My question is how do I get my 10 week old daughter to STTN? We’ve been following babywise since she was a couple weeks old, she’s been on a 3 hour feeding schedule that starts at 7a.m. and we’ve been doing CIO for a couple weeks and she pretty much has that mastered. She cries between 5 and 15 minutes at naptime and bedtime, but pretty much always falls asleep on her own. Our dream feed is between 9:30 and 10:00, we give her an exta ounce of breastmilk at that feeding (she eats faster with a bottle when she’s tired), and then she wakes up at 4/4:30. Occasionally she’ll wake in the 3:00 hour, but I can usually soothe her back to sleep with a pacifier for another 30-60 minutes. When she wakes up during the 4:00 hour, she’s definitely hungry. She starts sucking before the bottle even reaches her mouth! I even tried to add an extra feeding to her day by going to a 2 1/2 hour feeding schedule and it didn’t help! I usually wait like 10 or 15 minutes JUST to see if she’ll fall back asleep but she NEVER does! Is there anything else I can do??? I want my sleep back so badly!!!!! Angie, sorry it took me some time to get back to you; with a newborn I don’t have as much time to respond to comments :)It sounds like she is hungry at night, and because of that, there isn’t much you can do. It sounds like you have tried what you can in the day. You basically need to just wait until she can do it. She is still young. It will come :)If you haven’t, you can try cluster feeding. That is feeding around 6-8 and then a dreamfeed also. It is discussed in today’s newborn summary post. Thanks for getting back to me. Joy has been pretty much sleeping through the night for a few weeks now. She will sleep anywhere from 8-9 hours, but she ALWAYS wakes up at one point. She wakes up between 3 and 5 and has to be soothed back to sleep with a pacifier or swing and she WILL go back to sleep until 6 or 6:30 which is perfect. But her 8-9 hours are never uninterrupted. Do you think this is just something that she’ll grow out of? My daughter is doing great with Babywise so far, on about a 3hr schedule. She is 5 1/2 weeks, over 10lbs at her last visit. I feed her at 10pm every night and then wake her at 3am because I was told she's not old enough to sleep through the night yet, and shouldn't let her go more than 5 hours. Should I continue to wake her or just let her sleep? Her morning feed is 5:30am (I'm back and work and need to leave the house by 6:30am). Angie, sorry, I never saw your comment until now. She might grow out of it, but she might also need to learn to sleep without a pacifier to do so. Drs. McLaughlin,Sorry this is so late to you. At that age, you could have let her go longer than 5 hours. By 5 weeks old, you can start to let them go longer. I bottle feed, so was wondering if I could try cluster feeding. We are currently on a 3 hour schedule so my daughter eats at 4:30 and then 7:30 and then bed with a dreamfeed at 10:30. She takes about 4.5-5 oz at 7:30 and is hard to wake and feed at 10:30… we are lucky to get 2 oz. Then, she wakes at 2am and 5am and start our day at 7:30. I'd really like to get rid of one of the middle of the night feedings so thought maybe cluster feeding would work, but will it with a formula if she takes so much at 7:30? She is only 4 weeks old. Any advice you can offer would be great – thanks! You definitely can. Hogg is a bottlefeeder, so her advice is always pertinent to the bottle feeder unless she says other wise. I would try it out and see how it goes.One thing Hogg mentions in the book is that if baby won't eat well at the dreamfeed, feed fewer ounces at the feeding prior to the dreamfeed (which you really couldn't control breastfeeding, but you can in a bottle). My daughter is 15 weeks old and is beginning to sleep through the night. She is on a 3 hour schedule, so now that she dropped her middle of the night feeding, she has 6 feedings a day instead of 7. Do I need to add a feeding during the day to make up for the calories lost? If so, does that mean putting her on a 2.5 hour schedule? I've noticed she has been fussier than normal, but it's just a guess that it's the lost feeding. I've also wondered if she is beginning early teething. Thanks for your help! I love your blog and have learned so much from your readers questions and your answers. I forgot to mention that at the 7.30pm feed, when I say we have to wake him – he doesn't really wake up at all. It's almost like a dreamfeed. Charliethewondercat,My guess would be he needs to have a bit less sleep in the day so he has more at night. I normally don't like to remove daytime sleep, but it sounds like he is "going to bed" at 5:30ish and then waking for the day at 6:30 AM, which is quite good 🙂 But not when you want it to be. So I would shoot for a little less sleep after the 4:30 feed and see how that goes. You might need to move the last feed up to 7:00 so he can be in bed for the night earlier.Also, try having him outside for a few minutes around noon each day. This can help set the circadian rhythm. Kyle, I need some more background info here. Have you been following any sort of schedule (Babywise or Baby whisperer) or have you been more just going with the flow? What you have done to this point is important in knowing what to do next. Hello! thank you for your blog! My daughter is 8 weeks old and we've been doing babywise since the start. She's had two nights where she slept through the night (seems like weeks ago) but has been waking up every 3-5 hours to feed since (that's not even consistent). She eats at 2.5 hour intervals during the day with her dream feed @ 10:30pm. Then she'll wake up anywhere between 2:30am and 4:30 am to feed again. After this feed she'll only sleep another 2.5 hours before she's up again. Any suggestions? Thanks! She is either going through a growth spurt or I would guess she is cold/hot/uncomfortable in the night. If it is a growth spurt, you can either wait it out or try to feed every two hours in the day.See the "nighttime sleep issues revised and updated" post for more ideas on what it could be. Good luck! Hi, Val. Our daughter is 8 weeks old and we've been doing BW for about two weeks now. She is on a 3 hour schedule, waking at 7am and going to bed 7-7:30. She sleeps well during the day, although often has trouble eating enough (sometimes only 3 oz instead of 4-5) during the day due to fussiness and gas (she is bottle-fed and we have switched to Gentlease). We implemented the DF a week ago and it doesn't seem to be helping…in fact, she seems to be going shorter stretches at night. Before we used the DF, she would go down at 7:30 and sleep 3-5 hours (even 7 hours once) for the first stretch and then 3 hours after that. Or, she would have two bigger chunks of 4 hours each between feedings. Now with the DF, she is waking up every 3 hours all night. My question is, should we keep at it to see if it helps? How do we get her to have a long stretch of sleep after the dream feed? We would be so much happier if she would even have just one night feeding, instead of two. Or should we drop the DF to see if she can go back to sleeping longer? Thanks! Hello, I had a question regarding cluster feeding and really just evening feeding and thought this might be a good spot to ask? We have been cluster feeding my daughter for a couple weeks. She'll be 8 weeks on Saturday so we want to stop soon. Here is where it's confusing. So typically I'll feed her around 3:30/4 and she'll be up 60-75 minutes. THen I put her down and she takes a cat nap at this time. All other day naps are normal (1.5ish hours). So say I feed her at 6 p.m. and then 8 pm. She'll take a full feed no matter what (I bottle feed) but she is SO tired for the 8 p.m. feed it's almost like it's a dreamfeed, but we do a dreamfeed at 10:30. I'd love to just do the 6 p.m. one (maybe stretch to 6:30) and skip the 8…but then it's only 7 feeds/day and she isn't quite through the night yet. A few times she has gone 10:45 p.m. till 4:45/5 a.m. but not consistently enough to drop a feed. I'd up her amount per bottle and make it 7 feeds, but she already eats a lot for her age (4 oz a feed, 8 times/day). Part of me just wonders if we are messing with her sleep cycle by waking her at 8 to eat. During the day she can go 3 hours between feeds but I end up doing a few 2.5 hour cycles to fit in 8 feeds – you know? Any advice? Thanks SO much. Help! My son is 6.5 weeks old. I'm doing 8 feedings a day (0730, 1000, 1230, 1500, 1730, 1930 and 2300 and my goal is 0500). He is waking up anywhere from 2:30-4:00 to be fed. What do I do? I know at this age he should be able to sleep for 6 hours straight. That actually sounds great for a baby that age. Yes, some can go longer, but not all do. Especially boys. I think he sounds like he is on the right path. Valerie- thanks. I ended up re-reading babywise and had to a day full of CIO. He is doing much better now. Napping well and going from 2200-04/0500. We are on Brinley's schedule at the same age and it's working great! I hope I'm able to still ask questions on this feed!! I have an 11 week old who has been on the baby wise schedule (eating every 2.5-3 hours). He has been sleeping until 4-4:30 am and one night 5 am. For the last week or week and a half he has been waking at 2-2:30 sometimes 1:30. Then again 4:30-5. I'm shooting for a 6:00 am feeding (would love 7 but I'll take 6!) I've been giving him a dream feed at 10:00. He was being swaddled and I've tried un swaddling him. He cluster feeds at night…. 7:30-9:30/10. I've been giving him 4 to 4.5 oz at the dream feed. I'm strictly breastfeeding but I pump and give a bottle at DF so I know how much he is getting. He doesn't show any signs of sleeping through the night so I need some suggestions please!! I'm soooo tired! He naps great (hour to 45 mins after wake time) and he can self soothe to go to sleep at naps and at night. Thank you!! Hi Carolyn! It could always be discomfort of some kind. Too hot, too cold…It could be a growth spurt at this age. You might also consider testing variable dreamfeed times. He might do be better with 10:30. I had two girls who were pretty particular. 10:25 was perfect but 10:30 meant waking up early in the morning. So test that out, too. I hope we can still add new questions on this thread, so giving it a shot. My son is 7 weeks old, have been doing BW since birth. He does great with a 3 hour schedule, self soothes for naps and bedtime, eats well. We swaddle and do bedtime routine between 7:00 and 7:30, and he has a DF at about 10 when I go to bed. I then let him sleep till he wakes. For several weeks that has been around 3am and 5am (giving him 7 feedings/24 hours), with a few days where he has dropped the 5am on his own or pushed it to around 6:30 (our wake time is 7:30). What should be our next step in STTN? He takes full feedings each time. A few ideas I had: move him to a 2.5 hour schedule during the day, change napping locations (he usually naps in his swing – moving or still) during the day in our living room, try to wean him off one of his two night feedings… Or is this just something he will work out on his own? Going back to work nights in 5 weeks and want it to be as smooth as possible for dad :)Thanks!! !